It was reported this week that Pécs’s Fidesz mayor Zsolt Páva and Fidesz MP Péter Hoppál called on residents of the southern Hungarian city not to rent offices to the Emberség Erejével Alapítvány (With the Power of Humanity Foundation, WPHF), which was recently awarded HUF 130 million (USD 500,000) from the Open Society Foundations to regrant to local organizations. 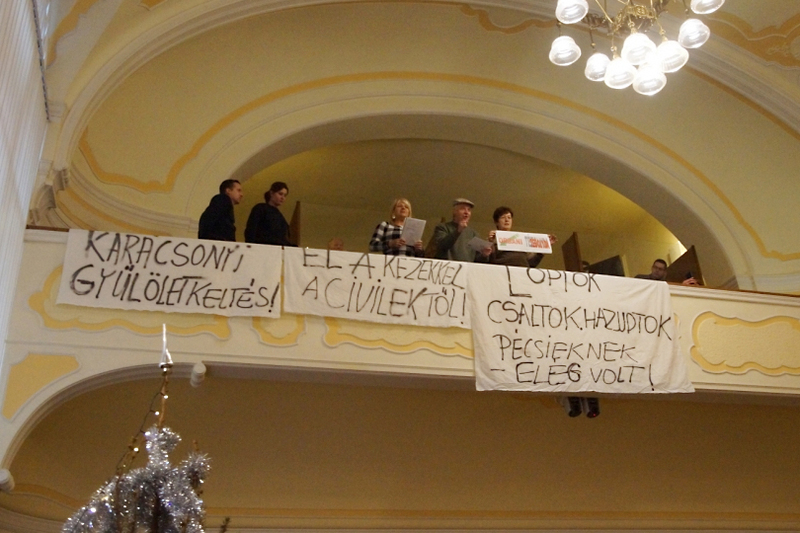 On Thursday, Szabad Pécs* (Free Pécs) reported that Pécs city council adopted a declaration calling on all residents and business owners in the city to refrain from renting space to the Emberség Erejével Alapítvány. (According to our sources, the declaration is not legally-binding, but certainly shows the city is willing to take a position that it looks unfavorably on property owners who would rent to the foundation). Opposition municipal representatives protested the declaration by not taking part in the vote. Jobbik representatives asked that the declaration be taken off the agenda. According to Szabad Pécs, the pressure from the Fidesz politicians worked. The Emberség Erejével Alapítvány was subsequently denied the opportunity to set up offices in a building after the building’s owner blocked the building manager from entering into a rental agreement with the foundation. It continues by explaining that the city wants to ensure Hungary remains led by a government capable of preventing “hundreds of thousands of migrants from destroying the future of Hungarians, their offspring, children, grandchildren, great-grandchildren, Christian Europe, and Hungary for the purpose of creating a mixed Islamicized continent and country. “We call on every citizen of Pécs, every business and organization, not to provide space for these Soros campaign centers. Do not sell, rent or provide them access to your property! Do not help them carry out the George Soros plan in our homes, Europe, homeland, or beloved city,” the declaration continues. *Szabad Pécs is considered by many to be the last bastion of a free press in the city. The site was launched after a media takeover in Pécs. It is a tremendous resource for Budapest-based journalists seeking information on the events unfolding there. Click here to learn how to support the work of Szabad Pécs.